“On the Yoga Beat: Live music and mantras accentuate the spiritual at two local yoga studios,” Jersey City Magazine, Spring 2015. “Fiction Fans: A JC writers’ group gets rave reviews with ‘genre night,'” Jersey City Magazine, Spring 2015. “From Memoir to Moving Picture: A bestselling book about Jersey City’s corrupt past is set to become a documentary,” Jersey City Magazine, Spring 2015. “Uptown Arts: Two theater groups move to a new stage,” 07030 Hoboken Magazine, Spring 2015. “Classroom Cool: Trends in kids’ stuff for the new school year,” Jersey City Magazine, Summer/Fall 2014. “Hovering above the Hudson: Helicopter tour offers awe-inspiring aerial views,” Jersey City Magazine, Spring 2014. Life-saving gift: Local resident receives kidney transplant from fishing buddy,” The Secaucus Reporter, March 11, 2012. “Love and acceptance for Lucas: Local mom launches volunteer program to aid autistic son,” The Secaucus Reporter, Oct. 21, 2012. “‘I had the Elvis curl. She had a car:’ How Bob and Marietta found long-lasting love,” The Hoboken Reporter, Aug 21, 2011. “The life of a water bottle: What happens to your Secaucus recycling after it leaves the curb?,” Hudson Reporter, Aug. 7, 2011. “Messy marsh! 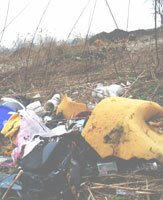 Waste disposal problem in Secaucus under investigation,” The Hudson Reporter, April 8, 2012. “Styrofoam ban sticks: Town refuses to retract resolution despite Styrofoam maker protest,” The Secaucus Reporter, Apr 22, 2012. 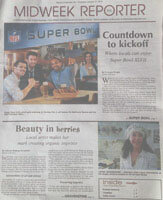 “Beauty in berries: Local artist makes her mark creating organic imprints,” The Hudson Reporter, Jan. 31, 2013. “‘The Nature of the Meadowlands:’ New book chronicles area’s history of transformation,” The Hudson Reporter, Oct. 14, 2012. “Trees of Hoboken: Local artist paints the urban forest,” The Hoboken Reporter, July 05, 2012.